Criminals are always looking for weak points when it comes to home security, and an automatic garage door can certainly be a weak point if the opener can be tripped from the outside or if the door doesn’t lock in place properly. Your garage could become a perfect entry point for intruders. Fortunately, there are some simple things you can do to secure your garage door and prevent it from becoming an access point for burglars. Modern automatic openers employ a “rolling code” that changes every time you press the button, ensuring that only your remote control can trigger your opener. If your garage door has an older model of opener that uses standardized or dip switch codes, a thief could use a simple code grabber device to imitate your remote’s signal and make your door open. Make sure your opener uses rolling code technology; if it doesn’t, our advice is to replace it with a newer model. Never leave your garage door’s remote control in your vehicle or someone who breaks into your car will get the chance to break into your house as well. Get your remote attached to a keychain, so that you can keep it on you. 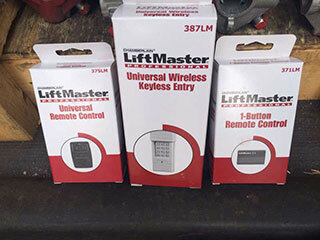 Alternatively you can also look at converting your smartphone to a remote control clicker, this is very convenient! If you let someone else use your remote control, make sure you get it back the instant they’re done with it. A simple lock or deadbolt on the door connecting your garage to your house can ensure that thieves who make it past your garage door get stopped from going further; think of it as another front door, and secure it accordingly. If you plan on keeping anything valuable inside your garage itself (besides your car), you might also want to frost or cover any windows to prevent passers-by from looking inside and deciding a break in would be worth it. If your garage door doesn’t close and lock in place properly, someone could force it open a crack and slide in underneath. If your opener is prone to tripping on its own, a thief might find your garage door wide open and walk into your home on a whim. Getting your garage door system looked at and organizing some preventative maintenance once or twice a year won’t just increase its shelf life and operational safety; it will also keep it safe from people looking for weak points. If you need some more specific advice on how to keep your garage safe from intruders, or require hands-on help with installing or testing security features, our team of experts at Garage Door Repair Justin is just a call away! Our professional technicians are highly dedicated to helping garage door owners with a variety of different problems and tasks. If you find yourself in need of anything from opener repair to spring replacement, don't hesitate to call us. Take a look at the rest of our website to learn more. Our technician will contact you before arriving. Until then, feel free to browse our website! Garage Door Repair Justin is at your service!